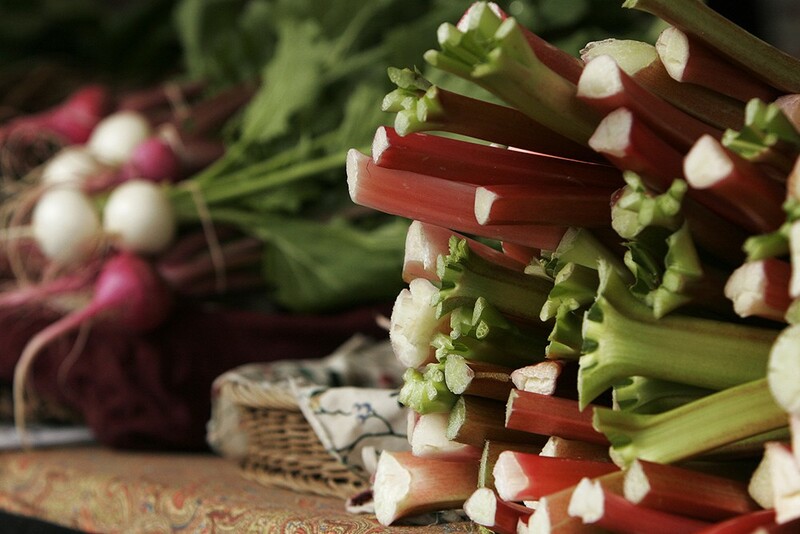 Rhubarb and radishes from Tolstoy Farms. Springtime found Stosh Jackowski hard at work shoveling manure from the bed of an old Dodge truck at Tolstoy Farms. At 75, he is both Tolstoy's oldest and longest continuous resident, having arrived in 1965. That was just two years after Huw Williams converted 240 acres of his family's land to create an "intentional community" in a wooded canyon outside of Davenport, 35 miles West of Spokane, a self-supporting cooperative where people would live and work the land together. Even though none of the farm's other residents has remained as long as Jackowski, the time-tested organic farming methods have remained "structurally the same" over the ensuing years, says Tim Pellow, a 21-year resident and the point of contact for Tolstoy's market garden. What isn't the same, says Pellow, is the average consumer, who now sees the benefits of shopping locally, supporting local farms, and "food grown using healthy, non-chemical inputs, and methods which do not abuse or deplete the soil, poison the groundwater, or threaten the health of farm workers or wild animals." Customers also appreciate and even expect variety, says Pellow. Two decades ago, iceberg lettuce was the norm, so on a good market day, Tolstoy might have sold eight to 10 heads at the Spokane Farmers' Market, which they helped form in 1998. "And it was a lot of work to get people to try a red leaf lettuce," he says. Now they typically sell more than a hundred heads of varying textures and color, the most popular being Hanson, an heirloom variety Pellow discovered through the Seed Savers Exchange. "Even the mainstream grocery stores have much more variety in their produce than they did decades ago," says Pellow, "though they can never touch the variety and quality of a good farmers market." In addition to selling at the Spokane Farmers' Market on Wednesdays and Saturdays from May through October, Tolstoy also sells weekly half- and full bushels of produce through a Community Supported Agriculture program. Both their market and CSA offerings change throughout the seasons and offer enormous variety, including herbs, carrots, cauliflower, corn, winter squash and pumpkins. This Main Market Co-Op recipe uses tahini to create a creamy dressing while adding protein and flavor. Main Market carries Tolstoy Farms produce in season. Toss vegetables to combine in large bowl. Then combine all dressing ingredients — an emulsion blender works well. Pour dressing over salad ingredients and toss to mix. For best flavor, allow salad to chill at least one hour prior to serving.